The whole of Marin Horizon‘s middle school (where Max goes) has been learning about Newton’s laws of motion this term, and specifically his laws of inertia. To tie in with the rest of the subjects’ take on myths and mediaeval Europe, the science has led to the children making catapults. First they learnt about forces and motion , and then started making marshmallow catapults to test some theories. They used Chinese takeaway cartons and experimented with different shapes of catapults, trebuchets and slingshots, seeing how far they could launch their tiny, sugary projectiles. And then came the main event: the pumpkin launchers. Children worked on their catapults in teams of three to five and built their catapults out of pieces of plywood. The size of the machines was limited only to their ability to get from the third floor of the building to the communal area outside on the ground floor. That meant that many of them were large enough to warrant having launching arms 8′ long. Families were invited along to witness the launch event and prizes were offered for the longest fling from each grade. The Language Arts teacher did a fabulous job as Master of Ceremonies and interspersed pumpkin launches with haikus (on flying pumpkins, naturally) and interviews with the young scientists. Each of the winning teams launched their pumpkins more than 34 metres (in some cases endangering the cars beyond the landing field). Their prize was lunch off-campus with the science teachers. Max’s team were the 6th grade winners. This project was so much better than just learning about forces. By playing with them and building machines that employed those forces directly, the children internalised their learning and had much more fun. 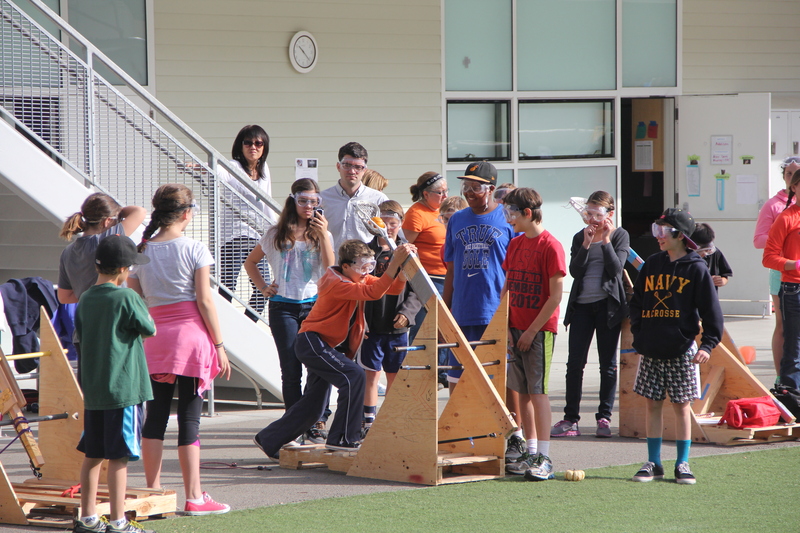 Not every aspect of the catapult-building was easy; there were disagreements and differences of opinion along the way, and the children had to learn how to overcome those too. But I suspect that what they learnt will stay with them forever because it used their hands and hearts, as well as their brains. Jesus, a middle school father, has put together this wonderful video, showing off launch day.